"Straight Out Of The Box"
Tamiya’s Gekko kit is ideally suited to building “out-of-the-box” (OOB). 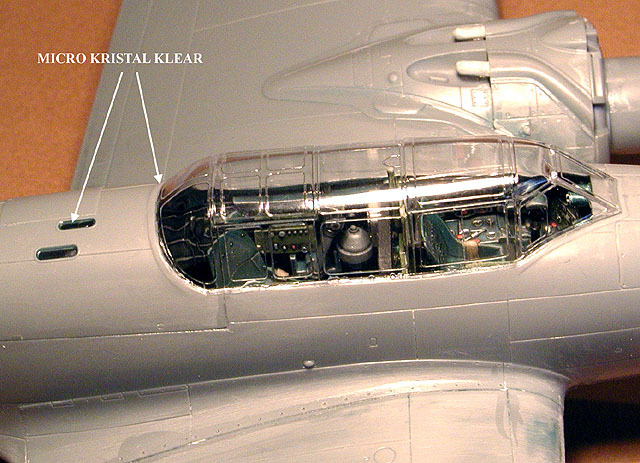 In Part One of this series I discussed some basic philosophies of OOB modeling, and described the painting and detailing of the interior of the kit. In Part Two, I will complete the interior, and move to the exterior with some pointers on preparing the model for paint, and improving some details while remaining within the boundaries of out-of-the-box-modeling. Please refer to Part One for a review of the I.P.M.S. “out-of-the-box” rules and discussion about “out-of-the-box” models. My intention is to help modelers improve their basic skills and mindset while providing proof that out of the box modeling can be fun and produce a great model. These opinions are my own, and reflect my years of experience, and what works for me. I write this article with a mindset towards contest models, but what I really intend to pass along is a way of thinking in terms of quality. Also, I will go back to basics and discuss some of the procedures that should become second nature in model building. Basic construction is the cornerstone of a good model! Researching a subject is one of my favorite aspects of this hobby. My inspiration to build a model is a combination of a love of history and the timely arrival of the latest kit from the industry. Actually, I sometimes have a hard time deciding if I am a modeler or a mini-historian because the two go hand in-hand so well. Thanks to a painfully accumulated library, my historical inspiration is usually well fueled, laying in wait for the plastic model industry to catch up. Fortunately, Gekkos have been well photographed, and WW2 close-ups that reveal good detail are plentiful. I recommend Famous Airplanes Of The World (F.A.O.W.) #57 and the 302 NFG special from Koku Fan for authentic WW2 photos. There is also excellent coverage of the NASM Gekko in the F.A.O.W. and in a new publication entitled Modeler’s Eye #1 Gekko. In these books I discovered an anomaly between reality and the Tamiya kit. Somewhere along the line, Gekko has been given an erroneous light perched in the clear nose cone of the aircraft. Tamiya has included this light in their kit. A searchlight? Landing light? The truth is, after looking at dozens of good, clear photos, some from the inside looking out, I cannot find a single photo of a light mounted in the nose of the aircraft. It’s a shame too, because the light looks very nice in there. I believe that the clear dome window was used to line up on targets for the lower set of guns used on early versions of the aircraft. When fitted, the lower guns were aimed through a second gun sight, mounted in the middle of the instrument panel, aiming forward and down through the flat window panels in the lower nose. An extra clear dome in the tip of the nose would provide a little extra edge to keep things lined up while maneuvering in the dark. When the lower guns were omitted with later models, the clear dome remained, because it was still useful to the pilot while landing. I decided to build my Gekko without the light in the nose. Tamiya’s kit features a separate nose cone that incorporates the clear dome and light. There is a solid nose fitted with radar arrays included with the kit that is meant for a future release. Without the light, it is very easy to see inside the model’s nose area. This is great for showing the detail of the air bottles and tanks in the nose, but it also shows the ejector pin marks and construction flaws more easily, especially so because the interior of the nose is bare aluminum. After painting the interior parts, it was time to test fit them into the proper locations. Not shown in the first part of this article were the radio set and the air bottles in the nose. In these photos you can see them installed into their proper places. I used Bare Metal Foil “Chrome” to simulate the retaining straps on the bottles and tanks. On the real aircraft these were black steel bands, but I decided they needed some extra punch to make them visible inside the nose compartment. I also decided to close the armament hatch just to be different, so the cannons were installed without the barrels in place. Before assembling any major parts, I always dry-fit them first. I look for major fit problems, panel alignments that may be a problem later, and make sure that the internal components fit properly without interfering with the fit of the fuselage halves. The next thing to do is prepare the mating surfaces. In order to make a really good join, the mating surfaces must be honed flat so that there will be no unforeseen gaps. Even Tamiya cannot overcome the limitations of the molding process, and the mating surfaces will not be perfectly flat. I use a variation of an automotive painters trick called color sanding. 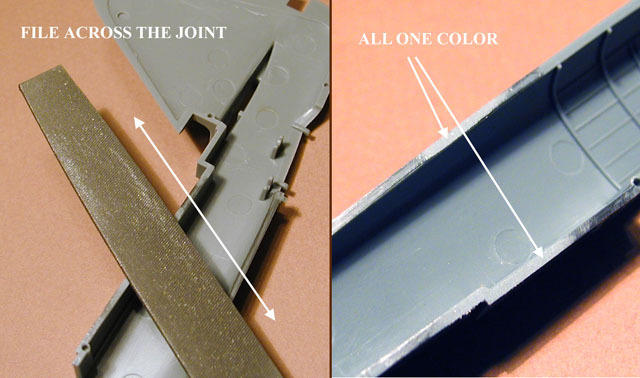 Color sanding is gradually removing layers of different color, such as black primer over gray, until the surface is a uniform color. The odd colors stay in valleys, and are removed from peaks, revealing where more attention is needed. Fill or sand as needed. My variation is to use a pencil on the edges of the mating surface. I use a six-inch flat file with a “single cut” (sometimes referred to as a mill file) to work the mating surfaces. I use the file laying flat across the fuselage and resting on both edges of the part. By working both edges at the same time, the file is supported all the way across the cut, ensuring that the area remains level and that both sides are even. When the pencil marks disappear across both edges, the mating surfaces are ready. I use this technique for any parts that are engineered in “halves”. 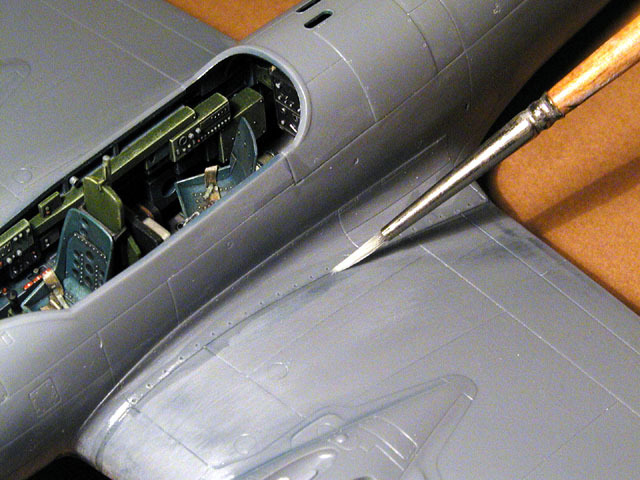 There are about as many different techniques for assembling models as there are adhesives. I have tried just about every available adhesive in American hobby shops over the past twenty years, and many that aren’t. I have switched from this brand to that, and varied my assembly techniques, but I keep going back to the way I was taught many years ago. In order to get a good solid join, one that I can count on for strength, liquid solvent is my choice. The solvent melts the plastic parts together, and then evaporates away, leaving a “welded” join. 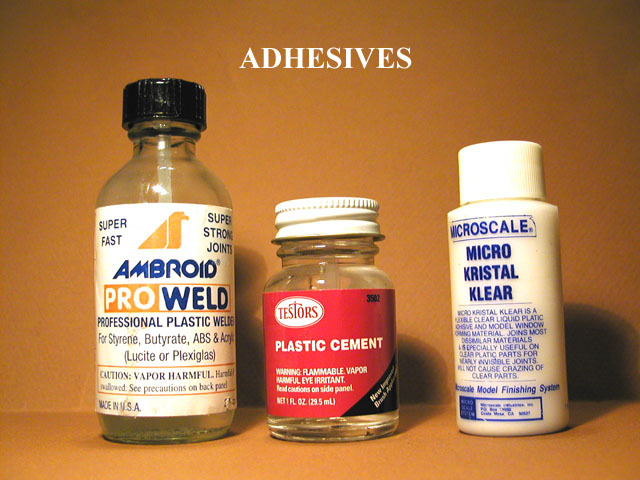 Other popular options are tube glue and CA adhesives, sometimes called “super” glue. I do not trust CA adhesives for joining major assemblies, especially halves, because I have experienced problems with them. I have had joined parts suddenly “POP” open. I have had adhesive refuse to set up. I have had adhesive turn brittle and fragile with age, leaving a model to virtually crumble apart. CA adhesive has great tensile strength (pulling) but bad shear strength (sideways movement). One good rap and the joint can shatter. However, CA adhesives are very good for attaching parts into sockets or locating holes, which provide the needed shear strength. My current favorite liquid adhesive is Ambroid Pro Weld. It is very fast evaporating, not too “hot” (destructive) and can be worked over in less than an hour. Because it evaporates so quickly, mistaken spills or “oops’” do not do too much damage. 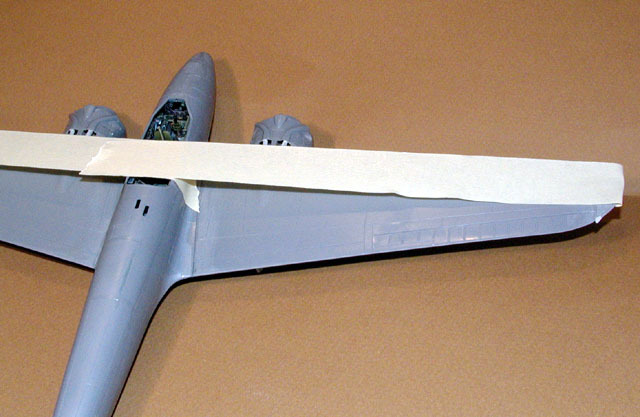 The liquid is applied directly to the joined fuselage parts along the seam. I prefer to use a #2 brush for application, but there are many other ways such as glass touch-n-flow rods or drafting pens. 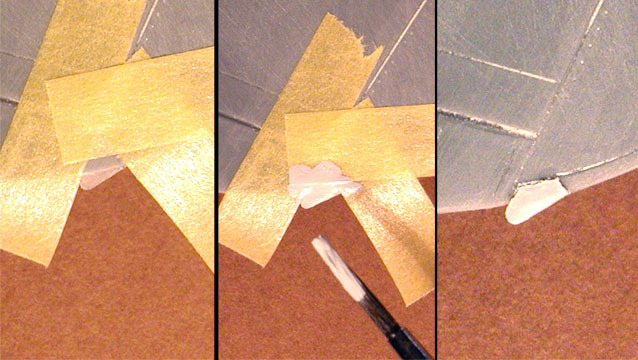 Leave the joint slightly open and apply the adhesive along the gap, working an inch or so at a time. After a second or so, squeeze the parts together until the liquid plastic beads slightly out of the joint. When the adhesive has completely evaporated, this bead becomes filler, and will usually need only a quick going over with wet-n-dry sandpaper to hide the seam. If all works well, there should be no need for any filler. The melted plastic did that for you. 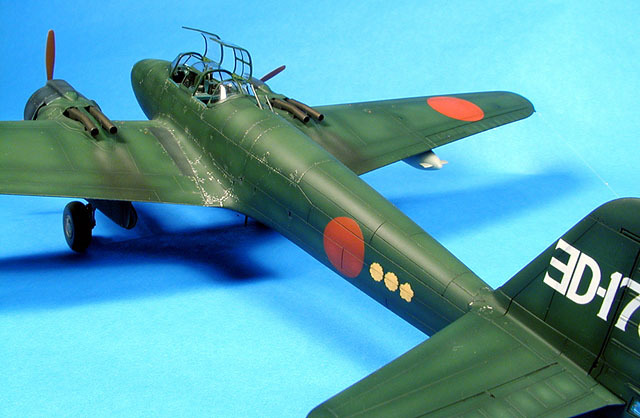 The Gekko has a few fuselage parts that are designed to be interchangeable with other versions of the aircraft. For example, the spine is a separate part, as it the tail fillet, the nose, and the weapon servicing hatch. This method is popular with manufactures and allows them to get the most from the molds. All of these parts fall on natural panel lines and should be easy to get them in place correctly and without a mess in the panel lines. Right? Well, let me tell you that if you don’t do it right, you will be sanding and re-scribing for sure! I have some techniques that can reduce the headaches. 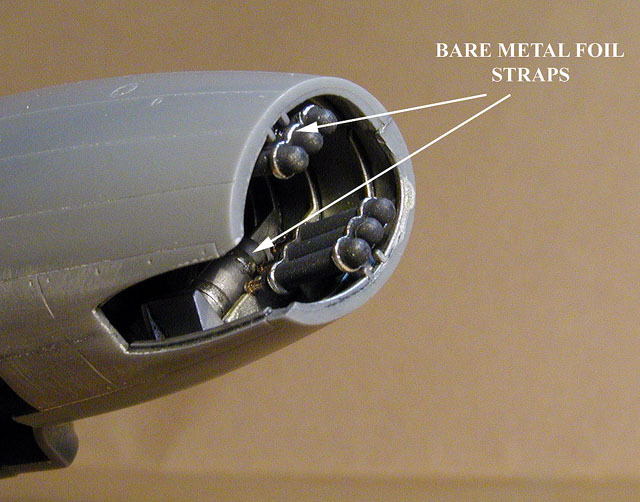 Like the fuselage halves, the mating surfaces of the insert parts need attention as well. It is not possible to get a perfect mating surface between the two parts, because of the insert design, but it is possible to improve the fit. 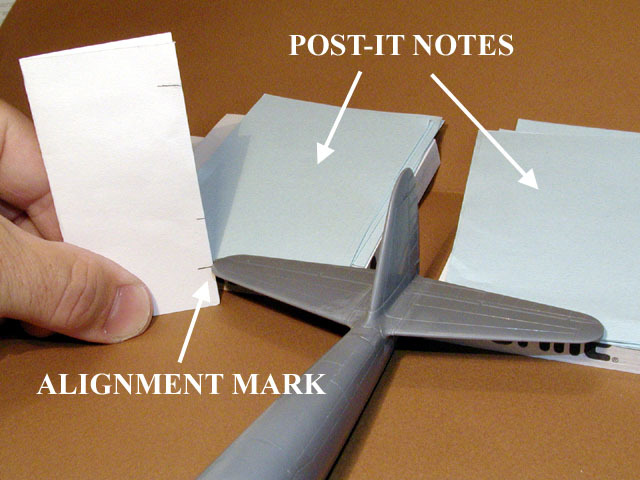 Use the pencil again to mark over the mating surfaces of both parts. The flat file is used again to reduce any ridges and bring everything flat. File the part to fit the opening exactly. Be careful and tedious. The idea is for the two mating surfaces to contact each other with enough interference to hold them together. A little loose is better than too tight. 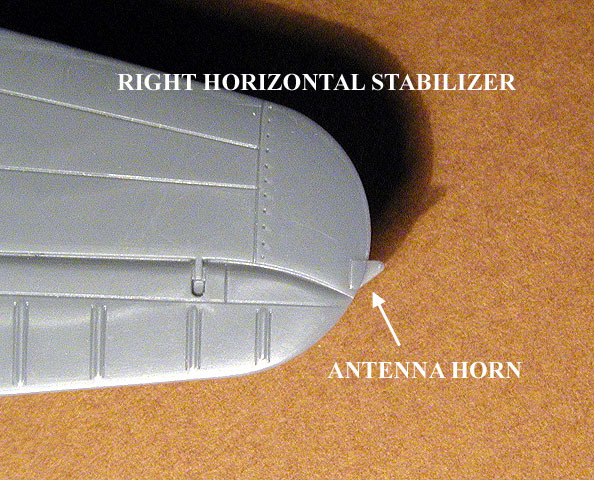 A tight fit may result in the panel line disappearing after the application of adhesive. (NOTE: I am building this model straight-out-of-the-box, therefore I cannot shim any of the parts with plastic). Now here is where things get weird, because the next step is to make sure that there is a gap between the parts because the panel line needs to prevail. I do this by slightly beveling or rounding the edges of each mating surface. I use a sharp hobby blade, and lightly scrape the part along the mating surface, which will become a panel line. Take care to match the fidelity of the original lines scribed on the rest of the model. By beveling both sides of the intended panel line, a nice even line will result when liquid cement is applied along the seam. Be careful with the adhesive and the parts. DO NOT apply any pressure AFTER the adhesive is applied because melted plastic will pop up and fill the panel line. Any clamping or taping in place should be done before any adhesive is applied. After the adhesive has evaporated and the parts are solid again, go over the panel lines with some 0000 steel wool, or fine Scotch Brite pads to smooth things over. 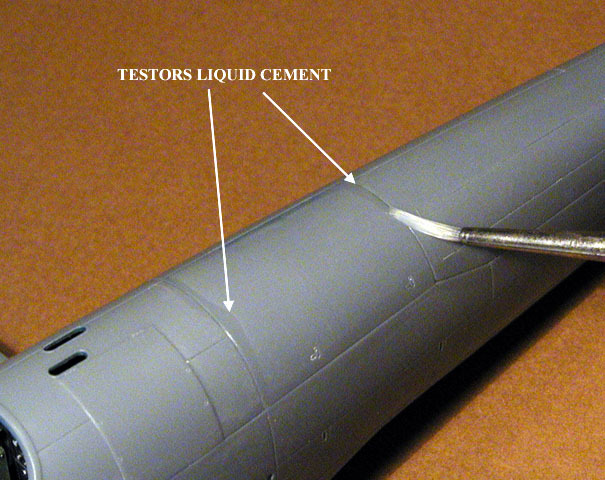 As a final touch, I use Testors liquid cement brushed on the panel line to gradually melt and smooth the line over. Testors liquid cement takes a very long time to evaporate, but I also very gentle to the plastic. Because of these properties it is not a good choice on major bonds, but is a good choice for blending and smoothing things over. I believe that Gunze also makes a slow adhesive but I have not tried it. If there are any gaps, Mr. Surfacer 500 brushed into the gap will fill it. Smooth over the Mr. Surfacer with cotton swab dipped in Mr. Color Thinner or some 91% isopropyl alcohol. When done properly, the insert should look like any other scribing on the model. Speaking of Mr. Surfacer, I have found that this primer/filler is an indispensable part of my toolbox. I recommend that you investigate this product for yourself. Mr. Surfacer 500 is a heavy bodied filler intended for brush application to fill slight imperfections such as a little gap, ding, slip of the scribing tool, or a good sized scratch. Mr. Surfacer 1000 is a fine-bodied primer that can be used with a brush or sprayed through an airbrush. 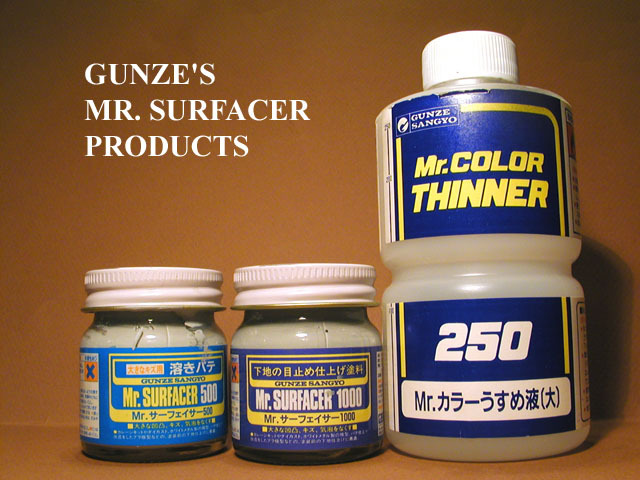 Mr. Surfacer 1000 is used to fill small imperfections and slight scratches, and when used with an airbrush it is a base coat for paint. Thinned 50% with lacquer thinner when sprayed, an eggshell finish is achieved that dries in about 10 minutes. You will have a hard time finding a better surface for painting. Thin it with Mr. Color Thinner, and the sheen is greater (semi-gloss) and the drying time increases to about 20 minutes. I love this stuff! Tamiya’s Gekko has been reviewed in several magazines, including Tamiya’s own model magazine. I have seen it written more than once that the engine nacelles, assembled separately, are attached to the wings along natural panel lines, and can be attached to the model after all painting is done. Well, folks, this just isn’t true. And to be frank, attaching major structural things after painting is not an approach that I like to take. The final quality of the model is too important to take for granted. 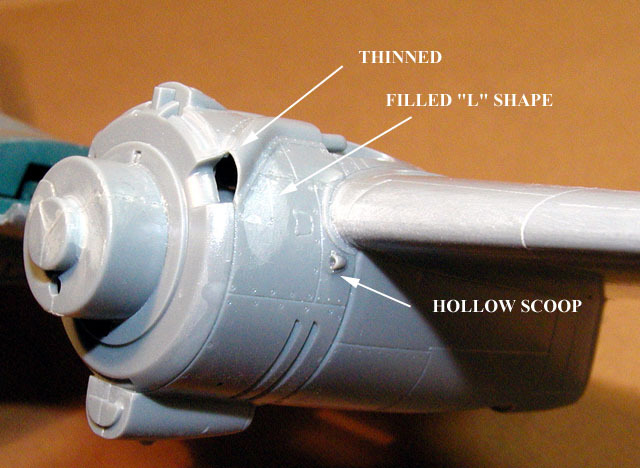 In truth, Tamiya has molded the engine nacelles so that they are as “generic” as possible, and able to accept new nacelles with further releases of the kit. The late versions of this aircraft feature individual ejector style exhausts, and some revised panel lines. The break actually falls halfway on a natural panel line, and then takes an “L” shape inside a square panel. The “L” shape must be filled in. The tricky part here is not destroying the little scoops and filler hatches molded into this area. I used Pro Weld on the joints, but did not squeeze the joint, because it falls halfway on a natural panel line. To fill the “L” shaped joint, I resorted to good old-fashioned putty (sort of). Actually, I used Tamiya’s putty, which is a fantastic product. Tamiya’s putty dries VERY quickly, ready to sand in 15 minutes with thin applications. 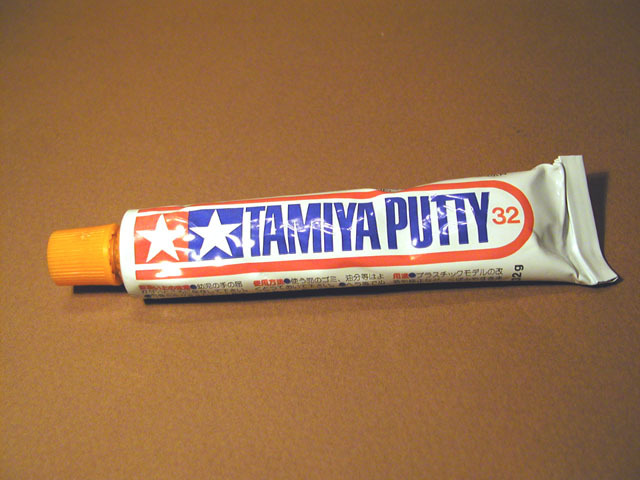 Tamiya’s putty also features metallic particles, aluminum possibly that give it both strength and shrink resistance. CA could have been used here as well, but the Tamiya putty sands easier, an important consideration around the small details in this area. Mr. Surfacer 500 over the sanded area will insure that no tiny imperfections remain. One more wet sanding, and the operation is complete. The nacelles can use some added attention to some details as well. There are two small scoops located on each nacelle that should be opened up. I use a sharp needle to probe the face of the scoop, and make the beginnings of an opening. Push the needle in, and wiggle it from side to side. Then use a sharp hobby blade to carve the little scoop out. To smooth things over, use a little dab of Testors liquid cement inside each scoop. On the top of the nacelles are the stubs where the exhaust pipes attach. The area around the stubs needs to be thinned to represent sheet metal and not molded plastic. I used a hobby blade to carve the openings to a more appropriate appearance. The tunnels covering the exhaust manifolds on the front of the nacelles needs attention as well. The cowl flaps should be thinned out for a more scale appearance. I chose the opened flaps, but either should be thinned. I use two methods for this. If the job is a big one, I will use a motor-tool and sanding drum to get things down to size. But usually, like here, I have used a curved blade, #10 in Exacto’s line, to scrape the cowl flaps into size. Then finish with fine sandpaper. Underneath, things get ugly. There is a seam that runs completely through and inside the exit portion of the oil coolers. No way was I going to spend the time sanding this out, way up inside a tubular structure, but it needed attention nonetheless. I decided to use a “home brew” liquefied putty flowed in with a brush. Mr. Surfacer 500 was not thick enough for this job! My brew consists of an old used bottle of Testors liquid cement, about half full, to which I have added a great-big dollop of Tamiya putty. Mixed up, and apply with an old paintbrush. I just put a good brush full right into the oil cooler exit hole, smoothed it around some, and let it dry. The liquid putty filled in the seams all around the inside of the orifice. Unfortunately, it also will fill in the horizontally etched oil cooler detail. This area is so hard to see on the finished model, I opted for getting the seams out over the little bit of detail. If this weren’t an OOB model, a nice piece of photo-etched grille would look nice in there…In the end, I painted the whole thing black inside, and I am OK with it. and pointed out a very interesting problem that I had not caught yet. 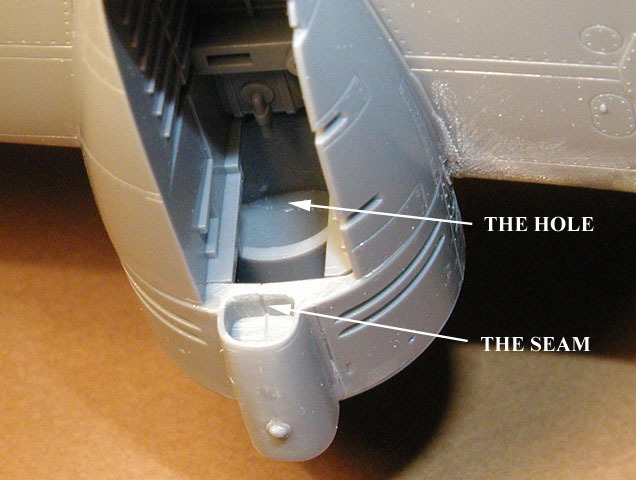 The front of the wheel well is completely open, and exposes the insides of the nacelles. It is literally a great-big hole. The gear legs hide much of this hole but anyone having a good look will notice it. Two options for an OOB model: Live with it, or fill the hole with an appropriate filler and sculpt/shape it to look like the forward gear well it its supposed to be. If I had noticed this before the nacelles were in place, it may have been possible to fix it with epoxy putty and some formers to retain the putty’s shape while curing. I did not wish to attempt this with the nacelles in place because access is too limited. So, I left it. But it bugs me. If you are not building this one OOB, you could simply use plastic card to manufacture a bulkhead. The wings feature separate wingtips that attach into slots like the Mosquito kit. One article I read stated that these tips were a problem, and tended to point upwards when attached. I flat-filed the joints flush using the pencil method, beveled the join line because it is on a natural panel line, and attached them in a perfectly normal attitude with no problem, and no fit problem. The Gekko has an antenna wire that stretches from the tip of the right horizontal stabilizer out to the tip of the right wing. There is a “horn” for the antenna molded onto the stabilizer tip, but curiously Tamiya has forgotten to include it on the wing tip. I decided to shape a blob of CA adhesive on the wingtip into the appropriate shape. A piece of tape backing up the wet adhesive holds it there while accelerator is applied. Then simply remove the tape and file or sand to shape. Masking the appropriate area and applying a heavy coat of Mr. Surfacer 500 simulated a fillet for the horn-attachment point to the wing. When dry, the mask is removed, and a raised fillet is formed. There is a clear part provided for the navigation light on each wingtip. I glued this in place with CA and then sanded and polished the parts for a perfectly blended fit. Just before the final primer coat, I masked these lights off with a liquid masking agent to protect the finish. One of the final touches to the finished model was painting these lights with Tamiya clear colors. Pro Weld was used along all the joints followed by steel wool and then Testors liquid cement in the proper intervals. While the wing dried, it was propped level and the tips were set on identical stacks of Post-It notes to insure that they measured the same during final assembly. This single step is perhaps the most important when it comes to preparing a model for a contest. The VERY FIRST thing a judge will do, is look at the model from the front and see if it all lines up perpendicular, parallel, vertical, horizontal, diagonal and symmetrical to his Mk. I Eyeball. I use a scale or a marked business card to make sure that all of the measurements are the same. The horizontal stabs are molded on natural panel lines as well, and were attached using the same method as the wings. 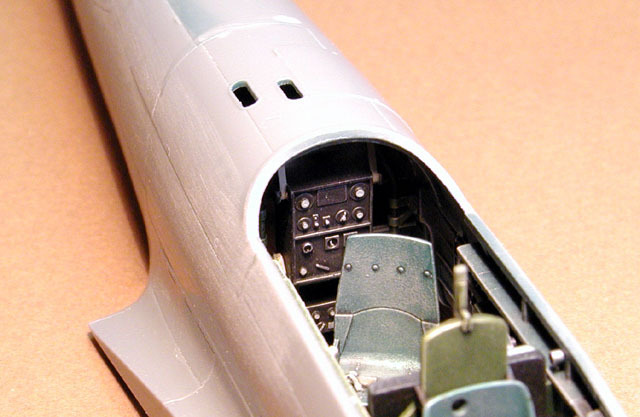 The model is now ready for primer, but the openings in the fuselage must be sealed first. 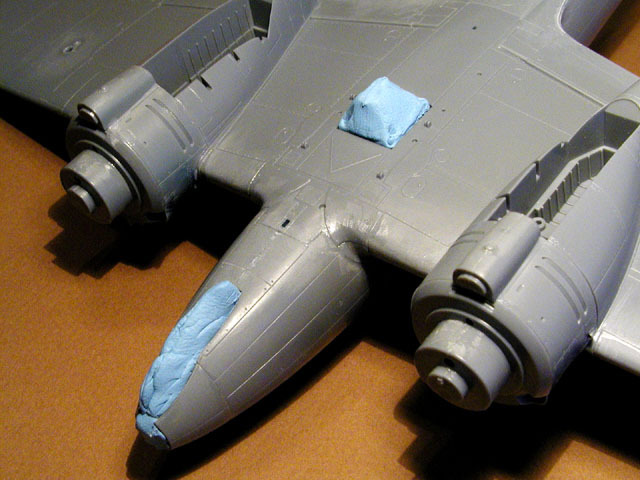 I used a blob of poster mounting clay, sometimes known as Blu-Tac to seal the nose glass and belly glass areas. Tamiya provides a closed canopy that would be extra on my model, so I used it to mask the cockpit area. Microscale’s Kristal Klear was used on the edges of the canopy to seal it temporarily. 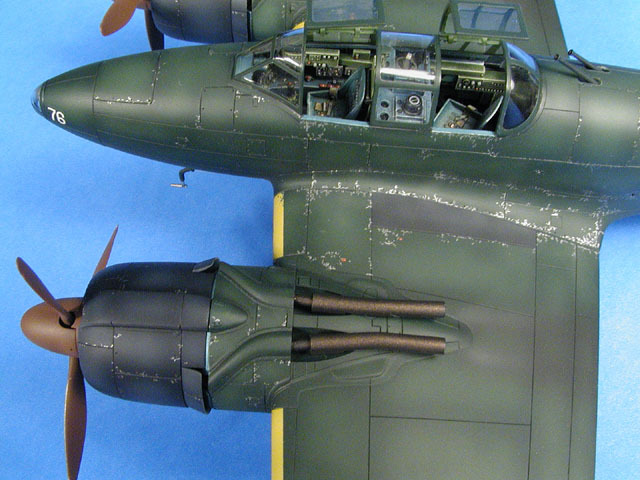 Sometimes I will install the canopy completely before painting a model, and other times, such as here, the fit is so good, that the canopies can be installed perfectly after painting. I also used Kristal Klear to seal the cannon ports. Like I mentioned earlier, I use Mr. Surfacer 1000 thinned with 50% lacquer thinner for a primer coat. I always begin spraying at wing roots or any angle that is near 90 degrees. I will usually spray this area with a good “wet” coat first so that any over spray will not collect in the vortex formed by the shape and the airflow over that area. If I did not do this, the area could end up looking “powdery” and rough. After that, Mr. Surfacer goes on the entire model with a moderately wet application. It is dry to handle in about thirty minutes, and workable after an hour. Some Mr. Surfacer 500 was used to fill some small imperfections, and after a final check, Gekko is ready for color.